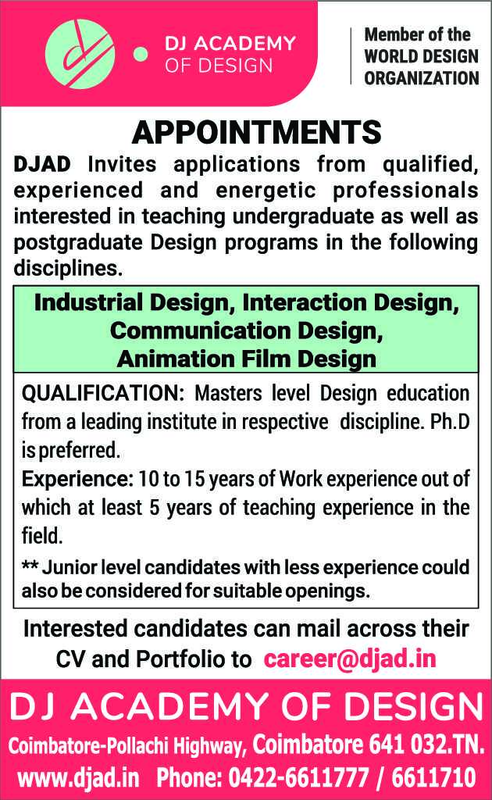 DJ Academy of Design, Coimbatore has advertised in THE HINDU newspaper for recruitment of Teaching Faculty jobs vacancies. Interested and eligible job aspirants are requested to apply immediately from 30th January 2019. Check out further more details below. About College: DJAD started with a joint certification programme with National Institute of Design, Ahmedabad. DJAD is also a founder member of the Indian Design Institutes Alliance [IDIAI which has formed NEED (National Entrance Examination in Design)]. Master level design education from a leading institute in respective discipline. Ph.D is preferred. Experience: 10 to 15 years of work experience, out of which, at least 5 years of teaching experience in the field.